What does it mean if your breast cancer spreads (metastasizes) to your lungs? What kind of symptoms might you expect, and what treatments are available? Whether you're worrying that your cancer may have spread, or if you've learned that it has, you probably have a lot of questions. While metastatic breast cancer isn't curable, it is still very treatable, and new treatment options have been improving the prognosis. The lungs are the second most common area where breast cancer spreads after bones. Other common sites of metastasis are the liver and brain, though breast cancer may spread to nearly any region of the body. When breast cancer spreads to the lungs it is still breast cancer. If you were to take a sample of the cells found in the lungs they would be breast cancer cells, not lung cancer cells. Some people mistakenly call this lung cancer, but instead, it is usually referred to as "breast cancer metastatic to the lungs" or breast cancer with lung metastases." It may also be referred to as "secondary breast cancer." Breast cancer cells can spread either through the lymphatic vessels or the bloodstream. Since all of the blood passes through the lungs to receive fresh oxygen, it's not surprising that the lungs are a common site of metastases. Though lung metastases are fairly common, not all lung nodules in women who have had breast cancer are metastases (see below), and further testing and often a biopsy is needed to make sure that what appears to be nodules isn't something else (like lung cancer or inflammation). In one large study, of women with metastatic breast cancer, 36.4 percent had lung metastases, and 10.5 percent had only lung metastases. This means that two-thirds of women who develop lung metastases have metastases to other regions of the body as well. Some people with breast cancer are more likely to develop lung metastases than others. Certainly, those with more advanced stages of early-stage breast cancer are more likely to have a distant recurrence, and this is true for those with higher tumor grades as well. The average amount of time between when the initial (primary) early-stage breast cancer is diagnosed and the development of lung metastases is 68.6 months. Lung metastases occur more commonly in women than in men with breast cancer, in African Americans vs Caucasians, and in those who have tumors that are estrogen receptor negative and HER2 positive, those who are both estrogen receptor and HER2 positive, and those who have triple negative breast cancer. Other symptoms may include wheezing, hoarseness, coughing up blood, fatigue, and unintentional weight loss. When breast cancer spreads to the pleura (the lining of the lungs), fluid builds up in the pleural cavity (a pleural effusion) which can compress the lungs and sometimes cause rapidly worsening shortness of breath. A pleural effusion may occur when breast cancer spreads to the lungs, but may also occur without lung metastases if the cancer spreads to lymph nodes in the mediastinum, the area of the chest between the lungs. There are several different options available for diagnosing lung metastases. Chest x-ray: A chest x-ray is often the first test done, but can miss small metastases or early lung cancers. Chest CT scan: A chest CT scan can pick up nodules that are much smaller than those seen on a plain chest x-ray, and can further characterize any abnormalities. PET scan: A PET scan is a test which looks for areas of rapidly growing tissue, and is a very accurate test for detecting metastases. MRI: Also called magnetic resonance imaging is used less often, but sometimes helpful. Bronchoscopy: A bronchoscopy is a test in which a flexible tube is placed in the mouth and extended down into the bronchi. It can be helpful in picking up tumors near the large airways. Not all lung nodules in women who have had breast cancer are metastases, and in fact, many are not. In a 2018 study, of lung nodules noted in women who had been treated for early-stage breast cancer, only 47 percent of the nodules represented breast metastases. Another 40 percent of the nodules were primary lung cancers (the most common being early-stage lung adenocarcinoma, the type of lung cancer most common in people who do not smoke), and 13 percent were benign (inflammation or pneumonia). Because of discordance. When people are initially treated for breast cancer, they will learn whether they are estrogen receptor positive or HER2 positive. This can change. Cancers aren't just an unchanging clone of cells, but continually develop new mutations and change their molecular profile. In a large study, for 20 percent of people the receptor status of the initial breast cancer was different than the receptor status of the breast cancer cells which had metastasized to the lungs. Options for lung biopsy include a percutaneous needle biopsy (a test in which a needle is inserted through the chest wall into the lungs to get a sample of tissue) or a transbronchial biopsy (a similar procedure but done through the bronchial wall during a bronchoscopy). Treatment options will vary depending on many factors, such as how many metastases are present (single, few, or many) and how extensive they are, whether the lungs are the only site of metastases or if metastases are present in other regions as well (such as the bones, liver, or brain), what treatments you have had in the past, the receptor status of the metastases (this can change), your general health, and more. Treatment options will also depend on your wishes, and how aggressive you wish to be. Systemic treatments: Systemic treatments are those which treat cancer cells located anywhere in the body. Local treatments: Local treatments treat only cancer cells located in a part of the body, in this case, the lungs. Hormonal therapy: The choice of hormonal therapy depends on whether it was used before or not, since a tumor which grew and spread with a treatment you were receiving (such as tamoxifen or one of the aromatase inhibitors) is likely resistant to that treatment. Targeted therapy: HER2 targeted therapies are often used to treat HER2 positive tumors. There are several new treatment options for metastatic HER2 breast cancer. Clinical trials: In addition to new combinations of the above categories of drugs, newer drugs such as immunotherapy and PARP inhibitors are being evaluated in clinical trials. Make sure to talk to your doctor about any clinical trials which are available, as the treatment of advanced cancers is changing rapidly. Radiation therapy: A specialized form of radiation therapy called stereotactic body radiation therapy (SBRT) delivers a high dose of radiation to a small area of tissue (different than the way radiation is used after a lumpectomy or mastectomy). In some cases, this is equivalent to surgical removal of a metastasis. Surgery: Surgery to remove a metastasis is called a metastasectomy, and may be considered if a single, or only a few metastases are present. In one recent study, metastasectomy prolonged overall survival in people who were given this option. The most common technique used is a wedge resection. Radiofrequency ablation (RFA): RFA hasn't been studied to the same degree, but may be used in some cases. Pleural effusions can either be benign, where fluid builds up in the pleural space due to inflammation, or malignant (malignant pleural effusion) which contains cancer cells. The first step in treatment is usually a thoracentesis, a procedure in which a needle is placed through the chest wall into the pleural cavity to withdraw a sample of fluid. If the effusion is large, a chest tube may need to be placed to drain the fluid. Unfortunately, even if fluid is removed from a pleural effusion, it often re-accumulates. If this occurs there are several options. Sometimes a stent is placed so that the fluid can drain continuously (people may go home and be able to drain the fluid themselves). Another option is pleurodesis. In this procedure, an irritating chemical (talc) is placed between the membranes causing them to scar together so that fluid can no longer accumulate. In severe cases, the pleura may need to be removed (pleurectomy). Learning you have metastatic breast cancer is frightening, and many people wonder if they will suffer. Fortunately, there are many ways to manage the common symptoms of lung metastases. Pain: The lungs themselves do not have nerve endings which detect pain, but irritation of the pleural lining from an effusion can be very uncomfortable. There are many options for controlling discomfort. Some people hold off on pain medications, fearing that they won't have options in the future if the pain gets worse. This is not the case, and it's important for your quality of life to have good pain control. Shortness of breath: There are a number of different measures that can help with shortness of breath. If you are having spasms in your airways, an inhaler may be used. Steroids used orally or intravenously are very helpful as well. Morphine can be very effective in reducing the symptom of shortness of breath along with the associated anxiety. Oxygen is not usually very helpful but is an option as well. Coughing: Often times, narcotic medications, even in small doses, can quiet an annoying cough. "Natural" approaches, such as avoiding breathing in cold air, pacing yourself when moving, avoiding irritants in the environment such as smoke and scents helps some people. A teaspoon of honey may also help reduce a cough. Airway obstruction: Sometimes lung metastases grow into the airways causing an obstruction. This can both lead to shortness of breath, and increase the risk of pneumonia developing beyond the obstruction. A stent may be placed to keep the airway open. There are other options as well, such as radiation therapy. The life expectancy after a diagnosis of lung metastases from breast cancer is not what we would wish, but it is improving. The median survival rate (the time at which half of people are alive and half have died) was 21 months, in one study, with 15.5 percent of people doing well after three years. The survival rate is likely higher if metastases are able to be removed or treated with SBRT, surgery (metastasectomy), or RFA. 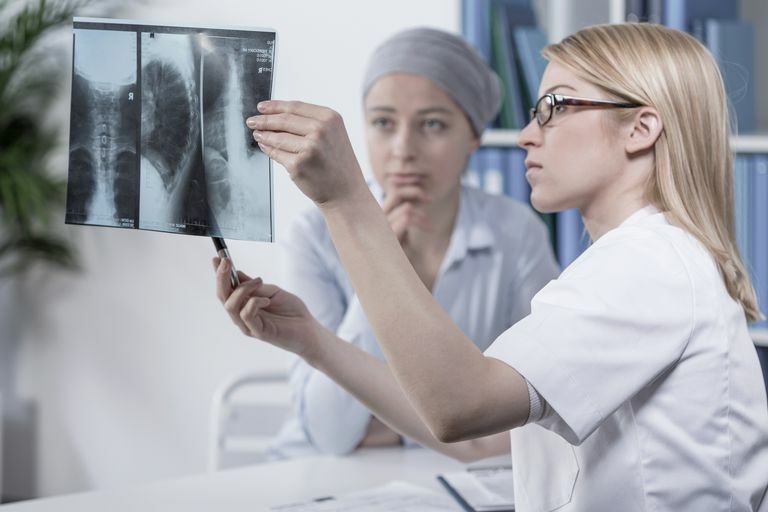 We don't have any studies that confirm this, but a 2018 review of studies to date found that that the 5-year survival rate among women who had lung metastases treated was 46 percent. For those who had a metastasectomy, specifically, the median overall survival increased to as much as 103 months. Overall, the prognosis appears to be better for women who have tumors that are both estrogen receptor and HER2 positive, those who have medical insurance, and those who are married. If you have been told that you may have lung metastases on an imaging test after having early-stage breast cancer in the past, it's important to have a biopsy. In studies, half, and up to three-fourths of lung nodules found turned out not to be metastatic breast cancer. Both systemic and local treatment options exist, and if you are a candidate for local treatments such as surgical removal of the metastases, or SBRT, it's likely that survival improves. There are also several clinical trials in place evaluating newer and better systemic therapies that may extend survival in the future. If you've just learned you have metastatic cancer, reach out to friends. Ask a lot of questions and be your own advocate in your care. Even when long-term survival is not possible, symptoms can often be controlled to give you the best quality of life possible while living with metastatic cancer. Berman, A., Thukral, A., Hwang, W., Solin, L., and N. Vapiwala. Incidence and Patterns of Distant Metastases for Patients with Early-Stage Breast Cancer after Breast Conservation Surgery. Clinical Breast Cancer. 2013. 13(2):88-94. Jin, X., and P. Mu. Targeting Breast Cancer Metastasis. Breast Cancer (Auckland). 2015. 9(Suppl 1):23-34. Matsuura, K., Itamoto, T., Noma, M. et al. Significance of Lung Biopsy for the Definitive Diagnosis of Lung Nodules in Breast Cancer Patients. Molecular and Clinical Oncology. 2018. 8(2):250-256. Shackcloth M., Love S. (2018) Role of Surgery in Lung Metastases from Breast Cancer. In: Wyld L., Markopoulos C., Leidenius M., Senkus-Konefka E. (eds) Breast Cancer Management for Surgeons. Springer, Cham. Xiao, W., Zheng, S., Liu, P. et al. Risk Factors and Survival Outcomes in Patients with Breast Cancer and Lung Metastases: A Population-Based Study. Cancer Medicine. 2018 Feb 23. (Epub ahead of print). When Is a Chest X-Ray Part of Breast Cancer Staging?